To create a new gallery, visit your profile and tap the "New Gallery" icon. Name your gallery and tap "create". A new blank gallery will appear on your profile. Now you're ready to start adding fyuses. Note: Your new gallery will default to being public, but you can choose to make it private. Private galleries will only be visible to users you've granted access to. When you've found a fyuse you want to add, tap the Echo icon. From here you have the choice to Echo to followers, create a new gallery, or add to an existing gallery. Tap on a gallery to add the fyuse. Tapping "New Gallery" will bring up the dialog from Step 1 and automatically add the fyuse once it's created. Return to your profile. You will notice that your Gallery icon has changed to the most recently added fyuse. To edit one of your galleries, tap the top right icon (●●●) when viewing the gallery. From this dialog, tap "Edit Gallery". You can rename your gallery or toggle on or off the "Make Private" setting. If desired, you can also remove the entire gallery by tapping "Remove gallery". 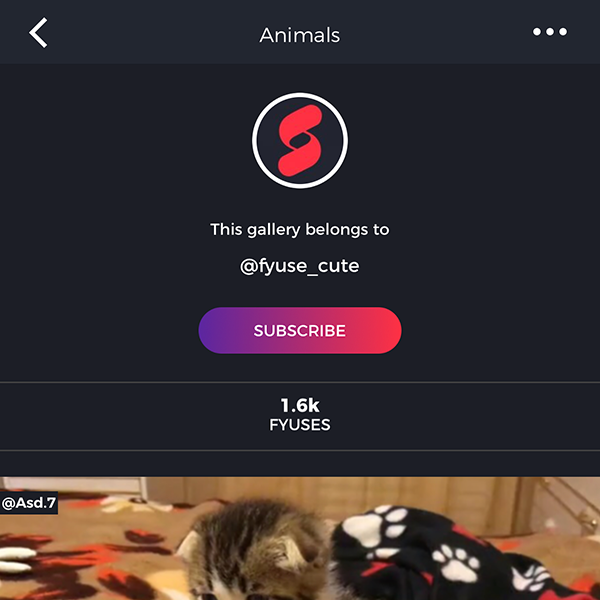 You can also subscribe to another user's gallery and it will appear as a channel in your explore tab. When viewing their gallery, tap the 'Subscribe' button above the fyuse count to subscribe. Visit your explore tap and you'll see the new channel added at the bottom of the list.